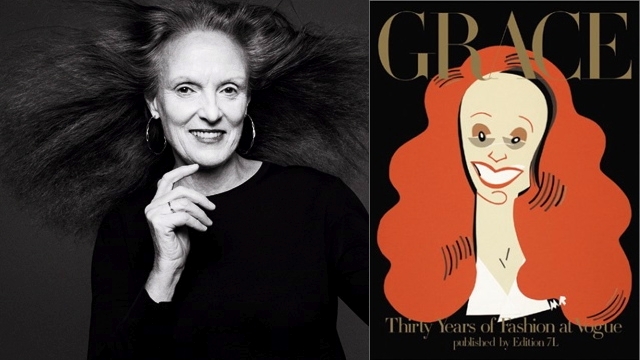 Grace Coddington, creative director of US Vogue, spoke in New York last night about her new memoir, Grace. The flame-haired former model was the break-out star of 2009 documentary The September Issue, stealing the show from Vogue editrix Anna Wintour with her slightly-crotchety opinions. She’s worked with the cream of the crop, from photography to styling to models, creating her trademark luxuriously narrative-driven editorial shoots. Ever since The September Issue threw her into the spotlight, Coddington said people have clamoured for a memoir. Notoriously shy, it took her a few years to cave. A reported $1.25million deal from Random House can’t have hurt either! It was interesting to hear Coddington in conversation, outlining her isolated childhood in desolate Wales. She admitted she knew nothing about fashion – her mother sewed all her clothes – but supposes she responded to the narratives of the photographs she coveted between glossy covers. Ever on the cusp of trends, Coddington found herself a model in London just as the 60s scene broke. How was it? It was wild. It literally changed overnight. With Mary Quant’s groundbreaking designs, suddenly young people had fashions to call their own. Overnight, Coddington said, the photographers changed, the music changed. Everything came alive. She also spent a lot of time in Paris, but says there was no comparison in the scene. The French are very chic. The English are absolutely not chic. But they can be cool. So how did this anti-screen queen manage to write a manuscript? Longhand. “So, there’s a longhand version of this book somewhere just waiting to be auctioned off?” asked an audience member. No, it’s all “scrumpled in a waste paper basket” somewhere. Grace – both the book and the human – seems warm, funny and a little uncomfortable in the spotlight, enough to share juicy tidbits someone more PR-beholden wouldn’t dare to. As well as gossip, the book is laced with fabulous photographs from throughout the decades, and fun little illustrations as well. For a taste, The Telegraph has an excerpt here you shouldn’t miss, particularly if you like jibes at Anna Wintour! The New York Times has a nice review too. So what does Coddington say are the three things you need to succeed as a creative director? Perseverance. You need to dream a bit. And be passionate about what you do. This has made me want to watch the September Issue. The fashion world can be so fascinating.